Dr. Wang started as an Instructor in the Department of Obstetrics and Gynecology at the Medical College of Wisconsin in February 2014. After she received her Ph.D. in Molecular Biology from the Max Planck Institute in Germany, she joined Dr. Mukhopadhyay’s Laboratory as a post-doctoral researcher at Harvard Medical School and then followed him to Mayo Clinic, where she established her interests in vascular biology and tumor biology. Her long-term research interests involve the development of a comprehensive understanding of the molecular mechanisms and the molecule-based diagnosis and therapy to woman cancer. Currently, she is focused on identifying the role of microenvironment in breast cancer and ovarian cancer progression. Role of astrocyte in breast cancer brain metastases. Angiopoietin Like 4, which contributes to the breast cancer brain metastasis formation. These studies suggest the role of astrocyte in breast cancer brain metastases, and further identification of the underlying mechanism will provide potential therapeutic targeting opportunities for breast cancer brain metastasis, which will lead to translational value in the clinic. Effects of ascites on chemo-resistance of ovarian cancer cells. Overcoming the acquired chemo-resistance is the major challenge in treating ovarian cancer patients. Recurrence occurs in almost all patients due to the ability of tumor cells acquiring chemo-resistance. Malignant ascites acts as a reservoir of a complex mixture of soluble factors and cellular components, which provide a pro-inflammatory and tumor-promoting microenvironment for tumor cells. Previous studies have revealed that cancer cells within the ascites possess enhanced resistance to therapies, which suggest that the chemo-resistance induced by ascites are vital for ovarian cancer treatment. However, how ascites contributes to ovarian cancer enhanced resistance to chemotherapy is yet to be elucidated. Previous studies have demonstrated that neurite outgrowth inhibitor B (Nogo-B) receptor (NgBR) is a new regulator promoting Epithelial Mesenchymal Transition (EMT) of breast cancer cells. In a collaboration with Dr. Qing Miao (Medical College of Wisconsin), we have identified that ascites from ovarian cancer patients induce ovarian cancer cell survival and increases chemo-resistance through Nogo-B/NgBR signaling. Currently, we are focused on establishing in vitro and in vivo approaches to evaluate if ascites from ovarian cancer patients is associated with the alteration of tumor cell phenotype to becoming more resistant to chemotherapy and to demonstrate if Nogo-B/ NgBR signaling in ovarian cancer cells is a critical regulatory system in promoting EMT and enhancing the resistance to chemotherapy. Dr. Wang has 45 peer reviewed publications and 1 book chapter. 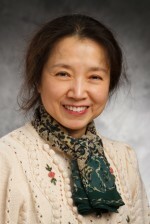 She has received numerous awards including a Postdoctoral Fellowship from the American Heart Association, a Women’s Health Research Program (WHRP) Grant Awards from Department of Obstetrics and Gynaecology in the Medical College of Wisconsin, and a Breast Cancer Research Program award from the Department of Defense.